All employees who have access to your personal data, or are associated with the handling of that data, are obliged to comply with the Data Protection Act. The following Privacy Statement details how we will look after your information. Where we need your consent we will ask for it. If personal data is subject to an automatic decision making process (by a computer), we will inform you of this in our individual service privacy notices. This will ensure that your personal information is reliable, accurate and up to date. We may need to appoint other organisations to carry out some activities on our behalf. Where this happens, we will ensure adequate protection by ensuring contracts and sharing agreements are in place that define the security controls around the sharing of the information. North Ayrshire Council is required by law to protect the public funds it administers. It may share information provided to it with other bodies responsible for auditing or administering public funds, in order to prevent and detect fraud. More information can be found on our National Fraud Initiative page. For more information, see Hotjar Privacy. 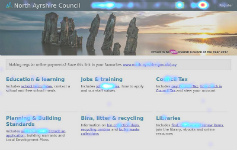 Where the council provides links to external websites, we are not responsible for the content of those external sites. You should read their privacy notices to learn how they deal with your information. You can find out more about your information rights on our data protection page. If you have concerns about the processing of your personal data, by the council, you may contact the Data Protection Officer. We will keep our privacy notice under regular review. This notice was last updated on the 28 May 2018.